Have you ever been camping and wished that you had a more comfortable bed? Or perhaps you had unexpected guests stay for the night and didn’t have any soft space for them to lay? Well then, you should try and get yourself the best foldable mattress possible. These versatile and portable mattresses provide plenty of comfort, without taking up a ton of space. This makes them perfect for camping or unexpected guests alike. Of course, you can’t just go out and get any old mattress. You need to think about the material they are made out of, how thick they are, and the number of layers they have. You should also take the size and firmness into consideration. 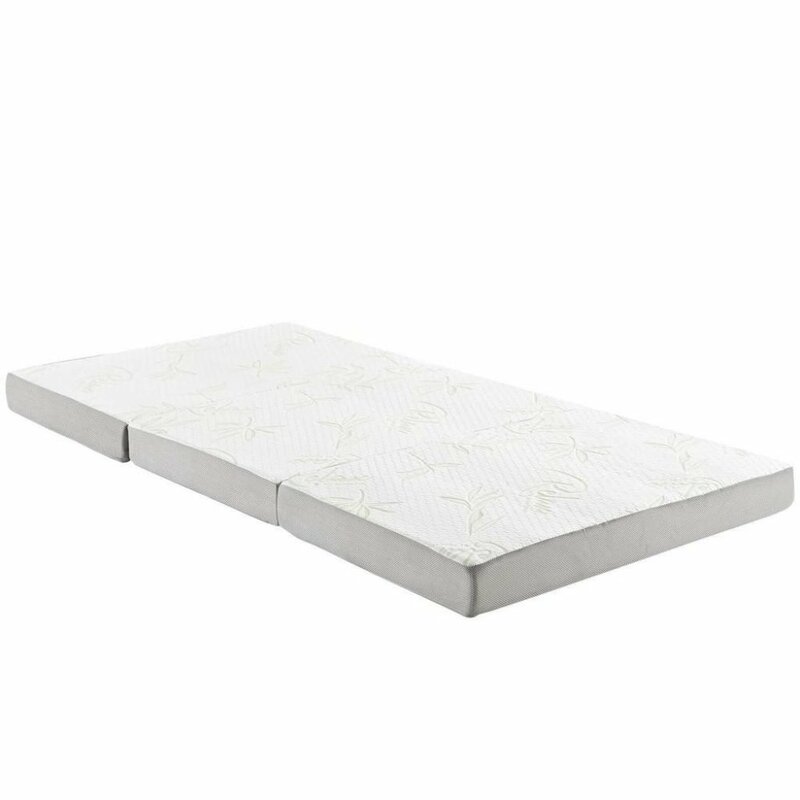 Since we were looking for the most portable mattresses possible, all of the models we selected are twin size mattresses, except for the Milliard Pack and Play, which is designed for babies. Now, you might be thinking that this is a bit overwhelming. Well, don’t worry! 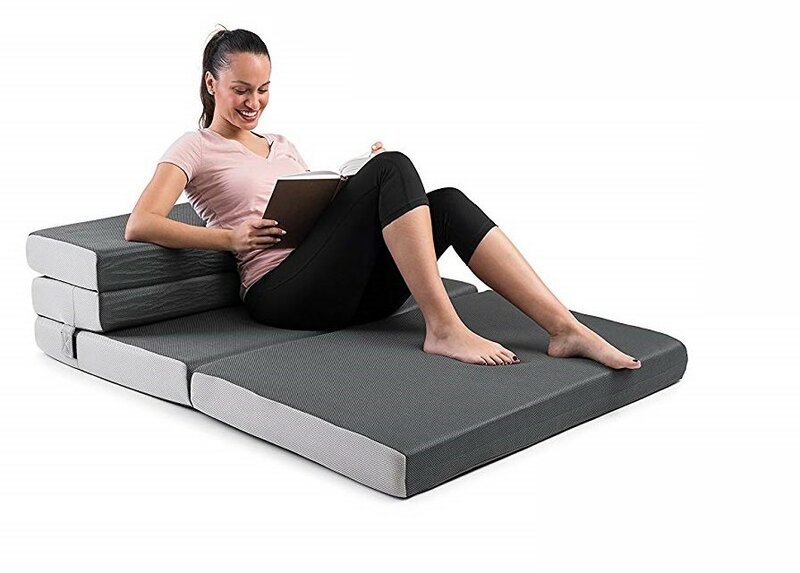 We have taken the time to read through hundreds of different user reviews to put together a comprehensive and easy-to-read table that is sure to contain the best foldable mattress for your needs. To help you decide, we have also written in-depth reviews for each of these mattresses. 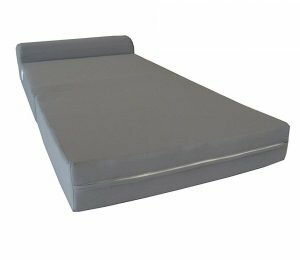 Of course, if you are still not sure what you are looking for in a foldable bed, then you can check out our detailed buying guide. This section will give you all the information you need to pick the perfect mattress. 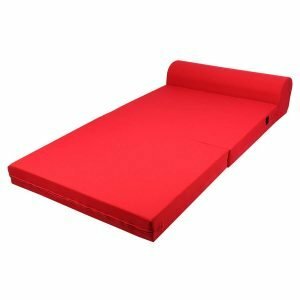 If you are in the market for the very best foldable mattress available, then you should check this model out. It is made with a double layer of foam. 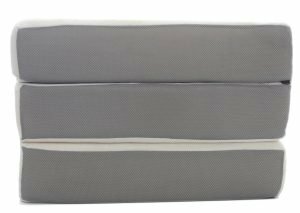 These two layers are combined to make this product one of the most comfortable foldable mattresses you can buy. The memory foam molds to the contours of your body quickly. It makes this mattress a good option for pretty much any type of sleeper, no matter if you like to sleep on your back, side, or stomach. 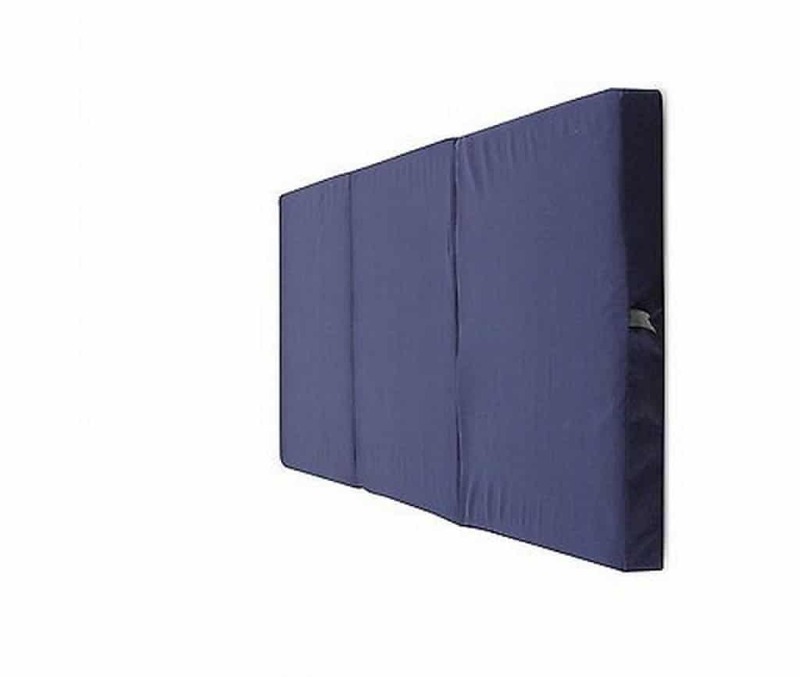 This versatility makes this a top choice for a foldable mattress. Another significant benefit that this type of foam offers is the fact that it is so well ventilated. This built-in ventilation will keep you comfortable all night long. The mattress also comes with a high-quality bamboo cover. Unlike other materials such as polyester, this cover doesn’t inhibit the breathability of the mattress, making it a perfect partnership. Bamboo covers are also highly durable, so you can rest assured that this cover, and the mattress underneath, will last you a good long time. The model has a textured bottom. This is designed to make sure that the mattress does not move around on you while you are sleeping. This will help you get a better night’s rest since the mattress won’t move around on you if you are a restless singer. 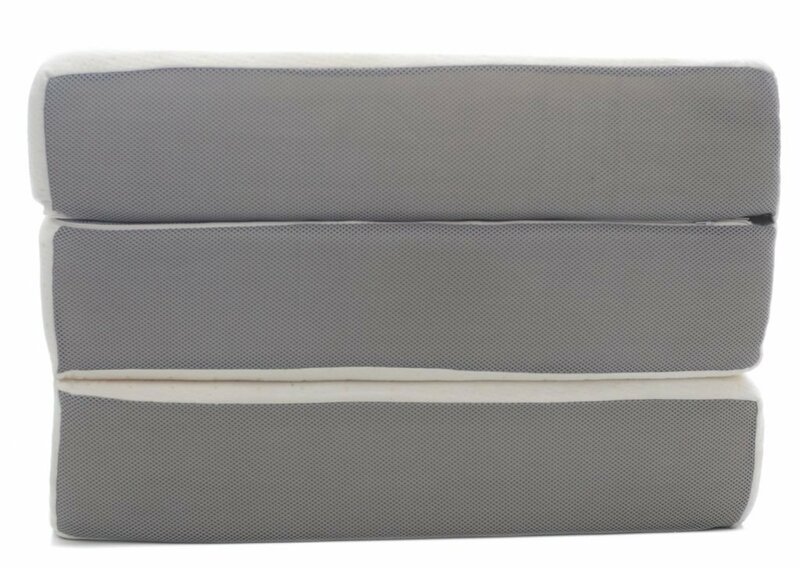 As you would expect of a foldable mattress, this model is very portable, even though it is on the heavier side for this type of bed. 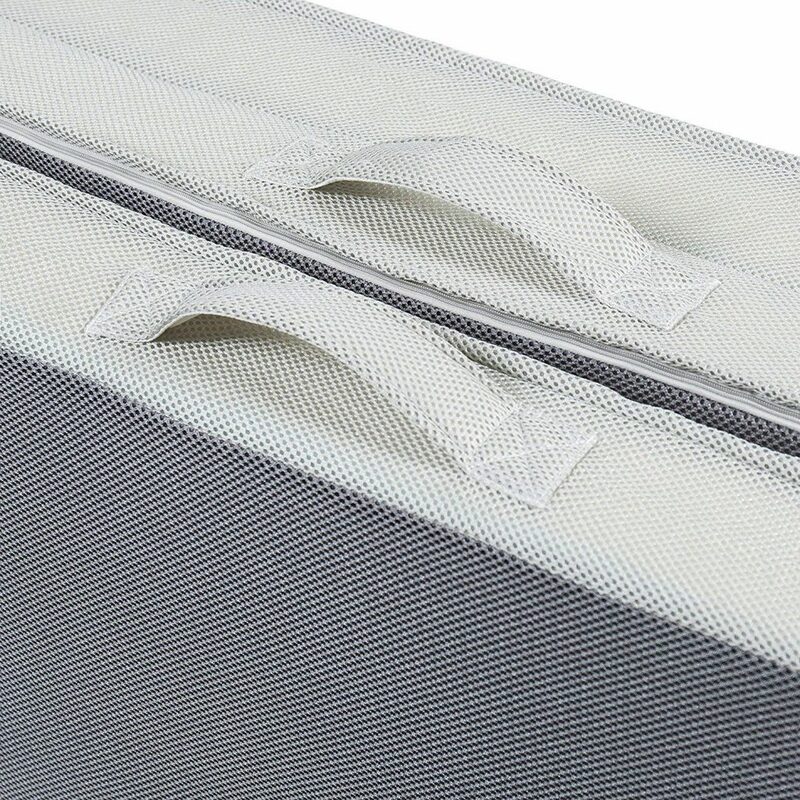 It comes with a carrying strap that makes transportation a cinch. While it would be nice if the company offered this mattress in a variety of sizes, this might cut down on its portability. Of all the different foldable mattresses that we looked through, this is one of the thickest. This makes it an excellent option for use in a guest room, dorm room, or on vacation. This extra thickness also makes it one of the best for larger individuals, which is not always the case with foldable mattresses in general. 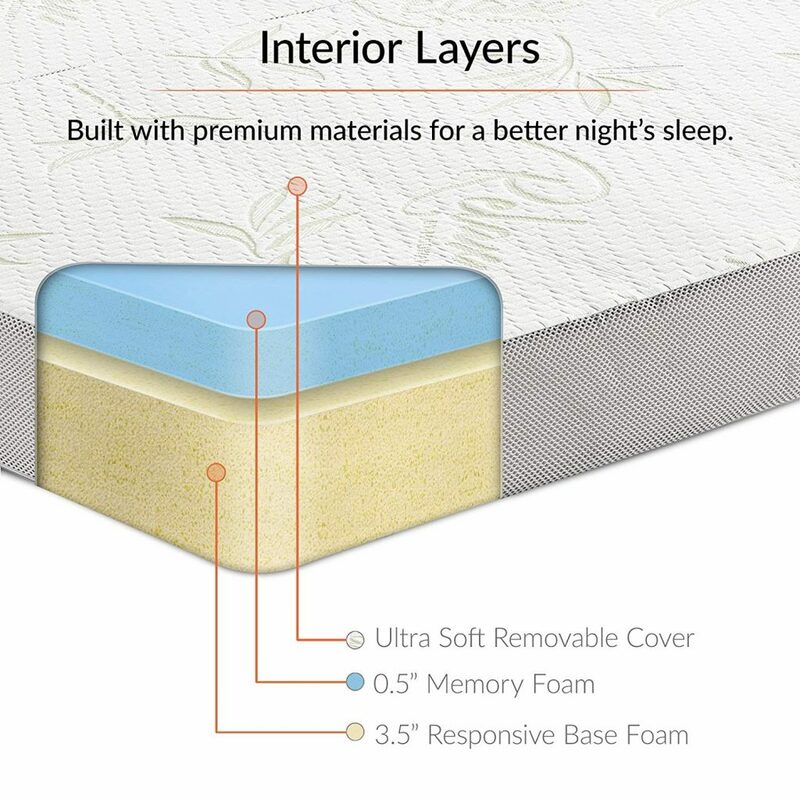 The memory foam inside of the mattress is very supportive and is designed to conform to the contour of your body, which will help you get a good night’s rest. Since this mattress can be folded up to a compact size, it is perfect for use in a camper. Of course, this extra-thick design does work against you in one way. Since this mattress is very thick, it is also very heavy. Now, this wouldn’t be all that much of a big deal if the mattress came with a carrying strap. Unfortunately, this is not the case, so you need to be sure that you have someone to help you move this mattress. It is not that it is too heavy for one person to lift, but that it would be awkward for one person to carry on their own due to its thickness. 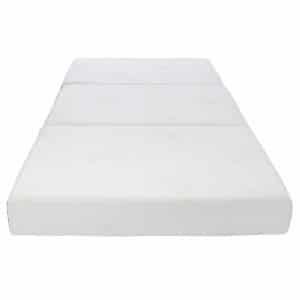 This memory foam mattress is great both side or front sleepers. This is mostly because it allows you to sink into it so that your spine is aligned correctly. Unfortunately, the contouring nature of this mattress reduces the comfort level for back sleepers, who generally need a firmer style bed. 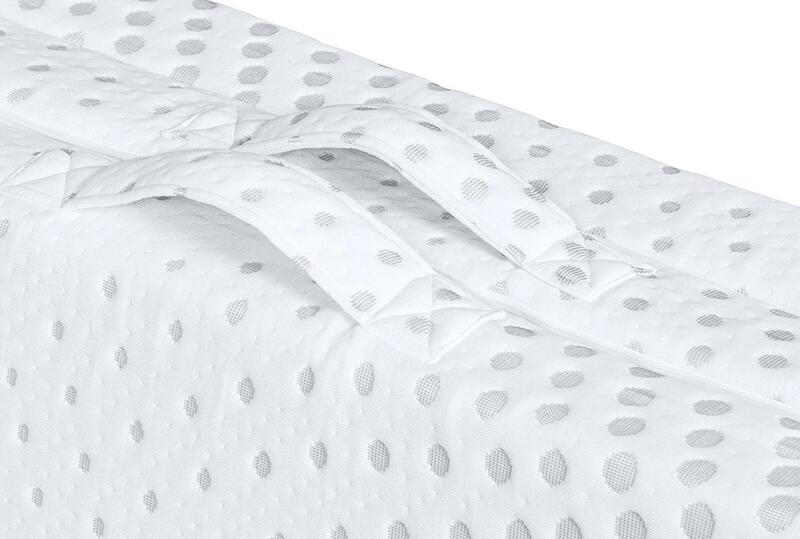 The topper that comes with this mattress is very easy to keep clean, remove, and put back on. 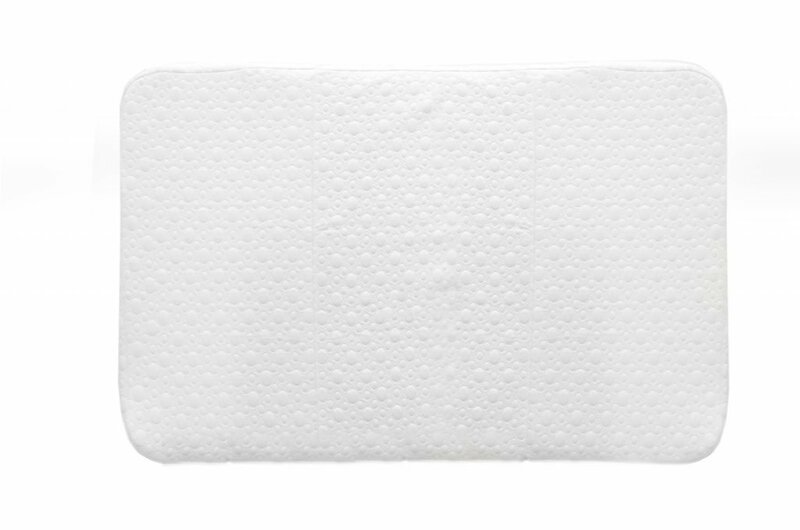 It is designed to be highly breathable, which helps keep you nice and cool during the night. 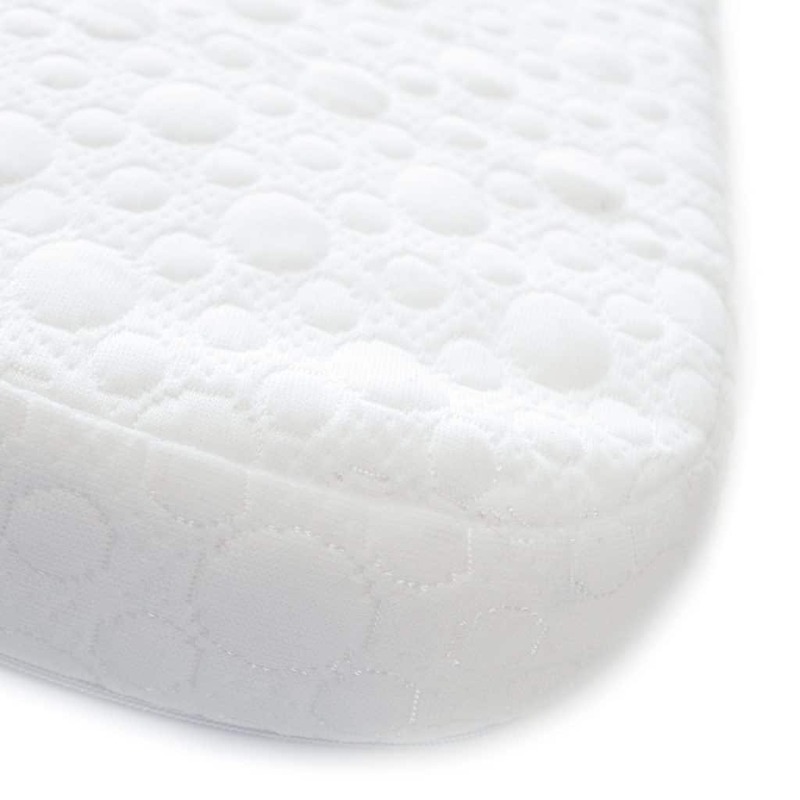 The mattress also has a non-slip grip on the bottom, which will keep you in place while you are sleeping. 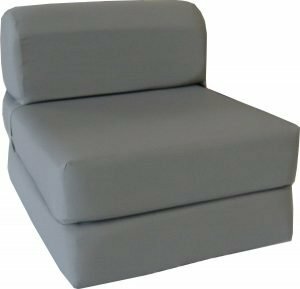 This increases the level of comfort that you will experience if you choose this model. 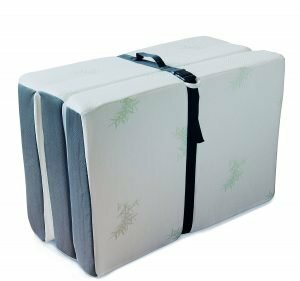 If you are in the market for an extra small, highly portable foldable mattress, then this is the model for you. 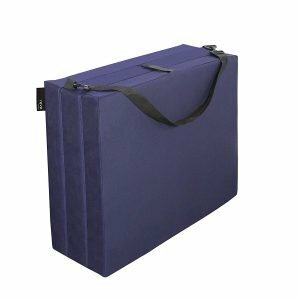 It is perfect for use at home or on the go, thanks to the carrying case that comes with this mattress. Since the mattress is so small, you can easily carry it with one hand or on one shoulder, leaving your other hand free to hold onto your little one. Of course, even if you don’t want to use the carrying case, you shouldn’t have any trouble moving this mattress to where you want to use it. When it is folded up, the mattress is only 12 inches long, which makes it simple to carry under your arm. It is even small enough that you would be able to fit it into another bag if you don’t have the carrying case with you, making this a great option for traveling with small children on vacation. The mattress is made of durable and soft polyester padding. This is then wrapped in a fiberglass lining, which is entirely fireproof. 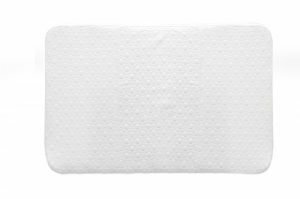 This cover is also very easy to clean, making it ideal for use with children who are well known to make tons of messes. This is a highly durable mattress that is built to last. Since it has a fiberglass lining, it will bounce back quickly and easily even after heavy use. Of course, this small size also limits who can use this mattress. While it is the perfect size for young children, it would not be comfy for an older child, teenager, or an adult. The best thing about a foldable mattress is that they can be used without a heavy bedframe. This versatility is what makes them so popular for travelers and if you have guests coming your way. 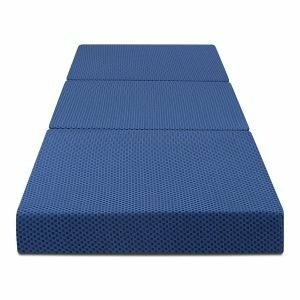 If you are looking for the best foldable floor mattress, then you have got to check this model out. It is made with two different layers of foam for added comfort and durability. 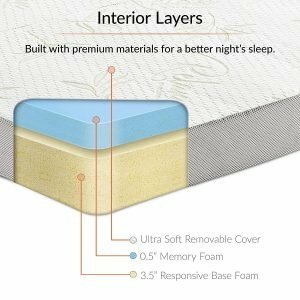 The smaller of these two layers is memory foam, which can provide you with the proper amount of contour that you would expect from memory foam. 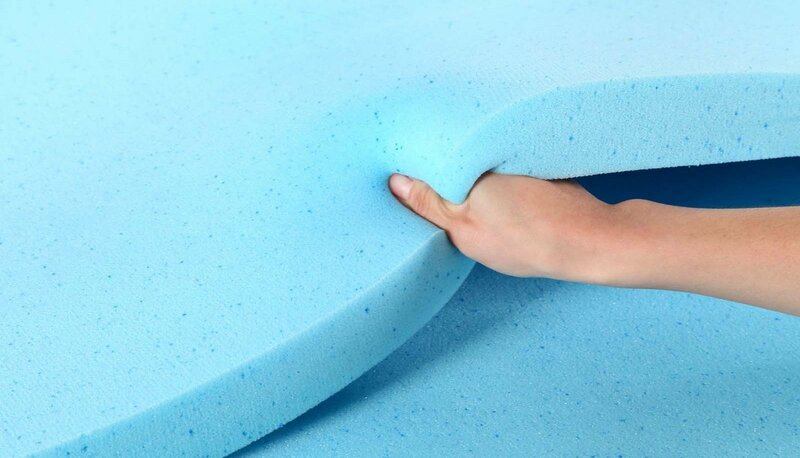 The second layer of foam is what makes this such a good option for use on the floor. This second larger layer is made out of durable and firm responsive foam. 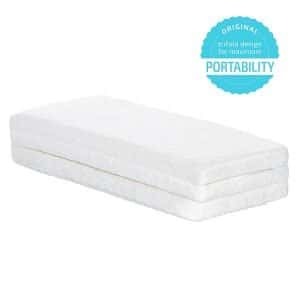 It provides all the support an adult will need when sleeping on the floor, without sinking in too much. 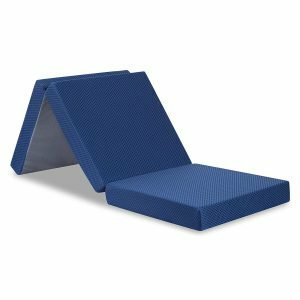 This helps to make sleeping on the floor much more comfortable than it would be with other foldable mattresses. Another great feature for this mattress is that it can be folded into a small couch. This versatile design feature makes for a comfortable seat for an adult or a child. When the mattress is folded up to a sofa, it is just large enough to accommodate one user, which makes it a great option when you are traveling or camping. Something else that makes the Modway a good option for use when traveling is how light it is. Since this mattress only weighs in at 16 pounds, pretty much anyone can carry it around, although a carrying strap would’ve made this easier. The cover is easy to clean and has a non-slip bottom, which makes it a great value that will keep the mattress useable for a longer amount of time. 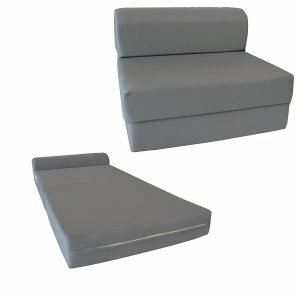 This foldable mattress from D&D Futon Furniture is one of the most flexible and comfortable options out there. Perhaps its best feature is the built-in headrest. This exciting option makes it possible to leave your pillow at home, which will save a ton of space in your vehicle. This will become even more essential if you intend to use this foldable mattress for camping since every bit of weight you can shave off your pack is a huge benefit to you. This mattress can also be quickly and easily transformed into a sofa, which is exceptionally comfortable. It can then be turned into a high chair. This versatility makes this mattress ideal for a variety of occasions, from travel to sleepovers, or even just playing video games in your living room. 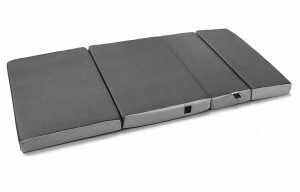 This is one of the thicker mattresses available on the market today, though it is not quite as comfortable and supportive as it could be. This is because it is not made with memory foam. It is instead constructed out of high-density white foam. This foam is much lighter than memory foam but is not as durable or supportive. This makes it best for using indoors, rather than outside. Since this is such a thick mattress, it is not quite as portable as it could be. It is about 12 inches thick when it is completely folded up, which might make it difficult to store when it is not in use. It is also one of the heavier mattresses on the market, which again, makes it a bit more challenging to move around. However, it is still a perfect choice for home use. While most foldable mattresses can be transformed into a sofa or folded up into an easy-to-move format, this model trumps them all. Instead of the normal three hinged areas, this mattress has four. This makes it possible to put it into a variety of comfortable positions. It also has Velcro on its sides to hold it into these positions. This makes it one of the most comfortable units for reading, writing, schoolwork, or watching TV. Of course, you can also just lay on it when it is flat and get a pretty good night’s rest as well. This particular mattress is made out of relatively thin high-density foam. It is incredibly lightweight, which makes it easy to move around to wherever you want to use it. 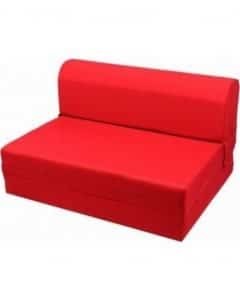 While this will provide enough comfort for smaller individuals, it might not be the best suited for larger people, especially if you intend to use it as a mattress on the floor. On the other hand, if you are going to be using this mattress as a topper for a standard bed, it should work out perfectly well, though this type of foam doesn’t always bounce back to its full plush after continuous use. Something else to keep in mind with this mattress is that it can have a bit of an odor when you first open it. This can last for a few weeks. While this odor is not quite strong enough to cause headaches or similar discomforts, it might be an issue for someone with a sensitive sense of smell. Thankfully, this smell doesn’t last for very long. This is especially true if you have it in a well-ventilated area. If, however, you put it in a closet, the smell will linger for a much longer time. This model is very similar to the Cozzzi, with a few notable differences. First off, this mattress can be folded up into a variety of positions aside from the standard flat, sofa, or compact. The big difference between these two different models is that the Velcro on this model is as strong as the Cozzzi’s. This makes it a bit more difficult to secure it into those custom positions. 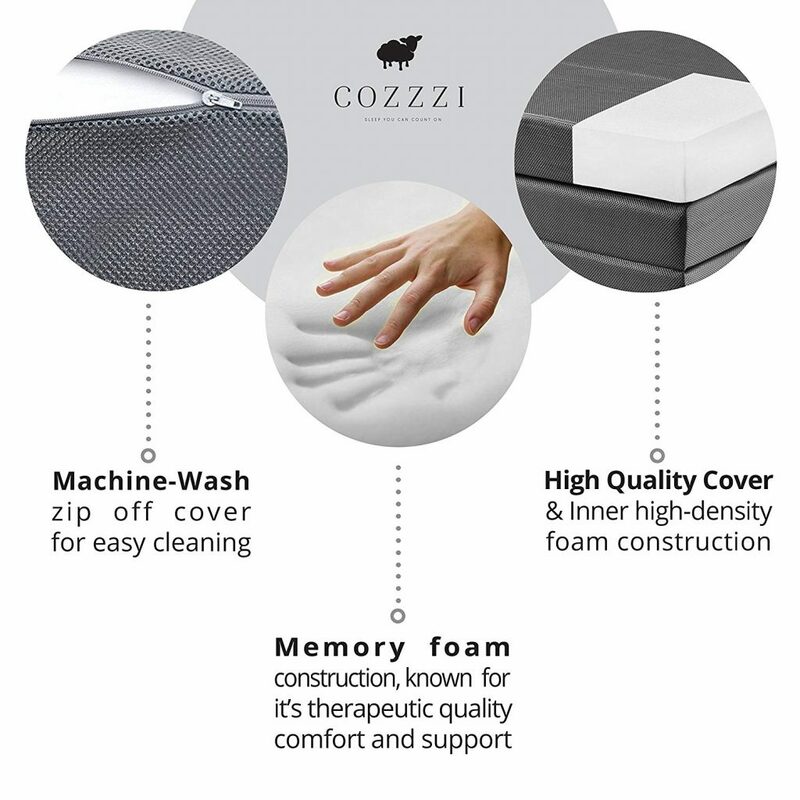 The Best Choice mattress does offer one distinct advantage over the Cozzzi, however. Unlike the Cozzzi, which only comes in one size, this mattress is offered in a couple of different sizes. This makes it a good choice for anyone who is a restless sleeper or wants to use it for more than one person at a time. 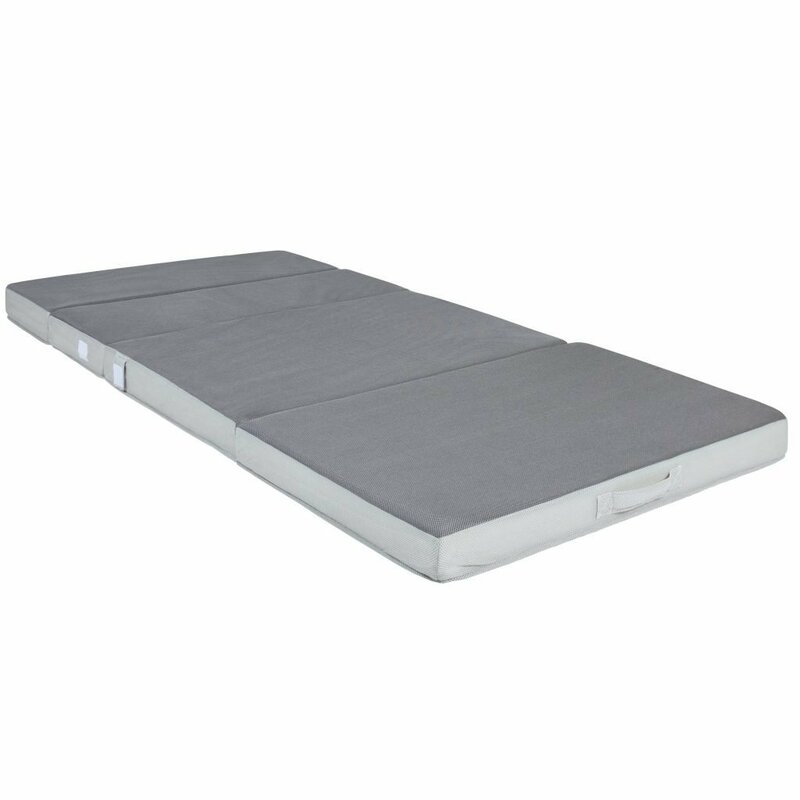 Since it comes in wider sizes, it is perfect for use as a mattress topper or, thanks to its lightweight and easy to carry design, for camping. It is an excellent option for taller individuals as well. Another bit of an issue with this mattress is its odor. Since it is made out of polyurethane, it has a very strong smell to it when you first get it home. This smell can be somewhat sharp at first. This could lead to headaches if you are not in a well-ventilated area. The best thing to do with this mattress should you choose to purchase it is to let it air out for a good long time before you need to use it. That way, you can eliminate its strong odor so that it doesn’t cause you any issues when you are sleeping or lounging on it. Lots of foldable mattresses and their standard counterparts have one issue in common. They are, unfortunately, quite smelly when they are first unboxed. This is mostly because of the different chemicals that are used in the manufacturing process. This is, thankfully, not the case with this particular model. Even if you lock it up in a closet right after you buy it, you should not notice any sort of an odor. 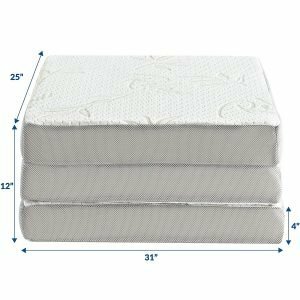 This makes it a great choice if you are looking for a foldable mattress on short notice since you can use it pretty much right away when you take it out of the box. That being said, this model does have some minor issues that you will want to take into account before you buy it. First off, it is rather narrow. While it is certainly large enough to be considered a twin size mattress, it is just barely wide enough for an average sized adult to lay on comfortably without hanging off the edge. It would probably be perfect for a child or teenager but might be a bit too small for everyone else. This mattress is made out of highly supportive memory foam. 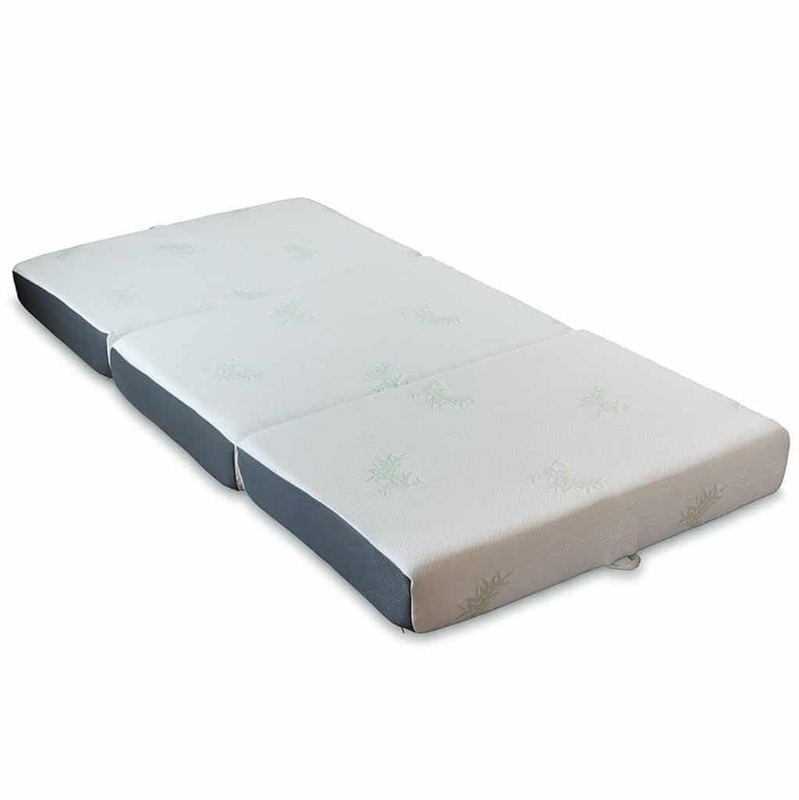 It is very good for any type of sleeper since it is designed to contour to your body as you rest perfectly. 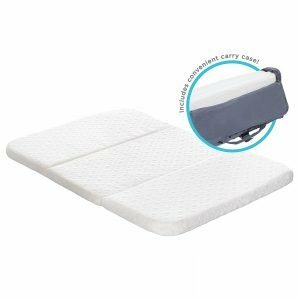 Unlike lots of other memory foam mattresses, however, this one seems to take an extra-long time to return to its normal shape after it has been used. This certainly is not the biggest deal if you are only going to be using it at night, it might cause an issue if it is going to be used to lounge around each day to watch TV or play games. If this mattress doesn’t get a break in between uses, it might start to break down and become unusable. If you are in the market for a mattress to use in a dorm room, then this might be the right model for you. It comes in a wide variety of bright and fun colors, which will allow you to better express yourself in how you set up your room. It is also perfect for someone to sleep overnight since it comes with a built-in headrest. This is a huge convenience since you won’t have to bring along a pillow of your own to use it. While having the ability to select from a variety of colors is a plus, you will want to choose your color carefully. The polyester cover is surprisingly tricky to clean. This is even more true for lighter colors, so be especially careful not to spill anything on your mattress, or you will quickly gain an assortment of stains that you simply cannot remove. You probably wouldn’t want to have to sleep on this mattress frequently, however. While it does provide a pillow, it is really short. This might make it tougher for a taller individual to truly get comfortable when they are laying down since they will constantly be hanging off of the edge of the mattress all night long. This mattress is one of the thickest models that you can select. It is also one of the softest. Since it is so soft, it is a perfect choice to use as a topper or as a mattress on the floor. You will just want to make sure that you give it plenty of time to rest in between uses. With a mattress this soft, you need to worry about it crashing and losing its ability to bounce to its original shape through prolonged use. 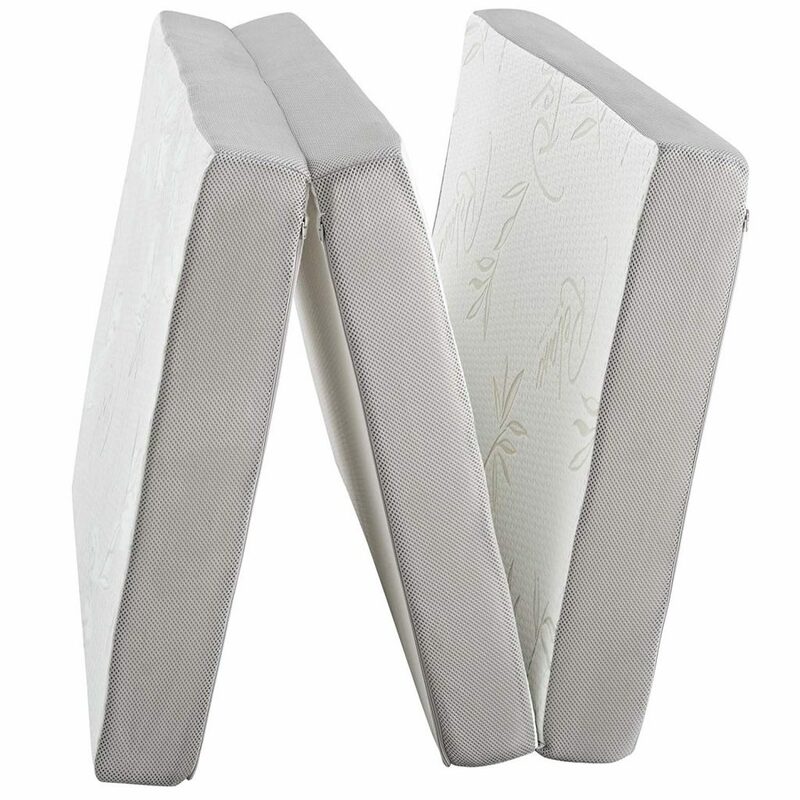 One of the most important factors when choosing a foldable mattress is its durability. 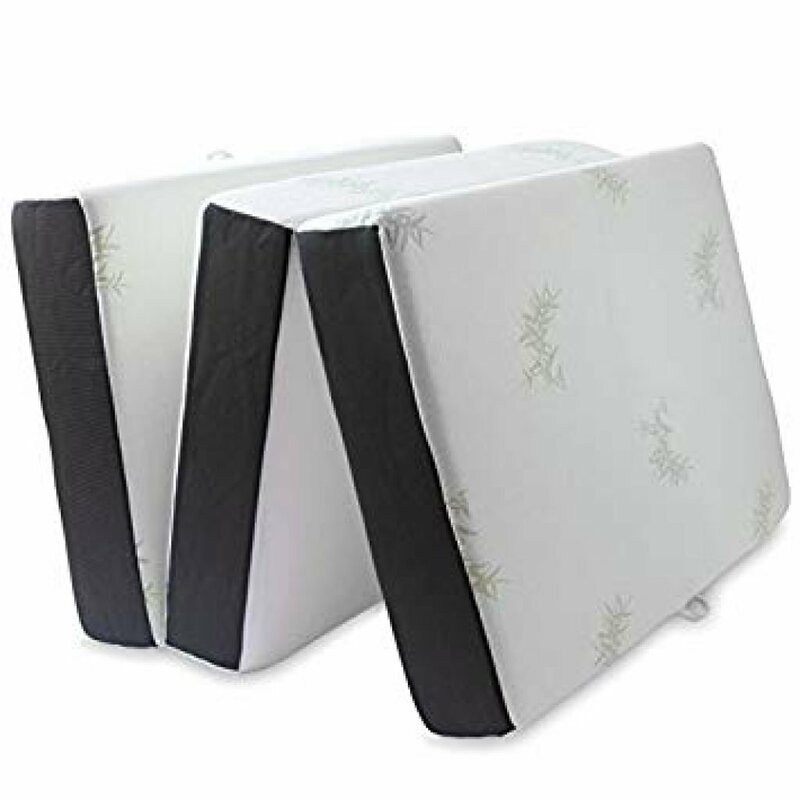 Since these mattresses are constantly folded and unfolded and carried all over the place, you don’t want the one that is going to fall apart on you quickly. This is one of the most durable and budget-friendly options that you could get. This is because it is double stitched at all of its seams. It helps to make sure that it doesn’t rip or tear, even after lots of use. The cover is also built to last. Since it is such a dark color, it hides stains extremely well. 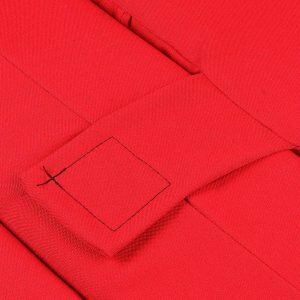 It is also made out of 100% polyester, which is famously easy to clean, even if a stain has been allowed to set in. The American Furniture mattress is one of the most comfortable mattresses to carry around with you, thanks to its oversized carrying strap. This strap is large enough that you can fit it over your shoulder to carry the mattress across your body. This makes it feel as though it is barely there, which is unsurprising, given that it only weighs about eight pounds altogether. The only drawback, however, is the fact that it is made with high-density foam. While this foam is quite firm, it does not bounce back well from heavy use. This will limit its effectiveness for larger individuals, unfortunately. That isn’t necessary to say that this mattress wouldn’t work well for smaller people, however. Since it is light to carry and durable, this mattress is almost tailor-made for use by a child. They are not always the most careful with their things, so the added durability is a big factor. 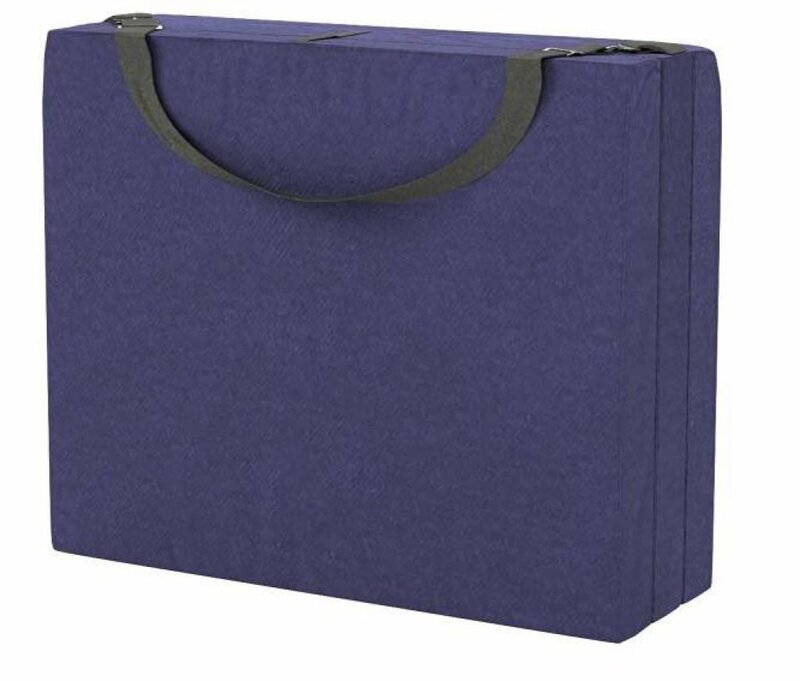 Plus, since it is so light and easy to carry, they can do it themselves, which will free you up to carry larger loads while you travel. 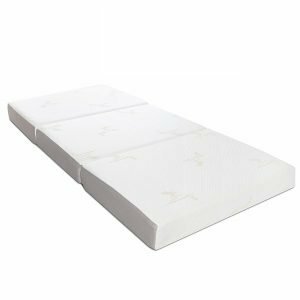 In this section, we will go through everything you need to know to find the best foldable mattress for your needs, no matter what they might be. 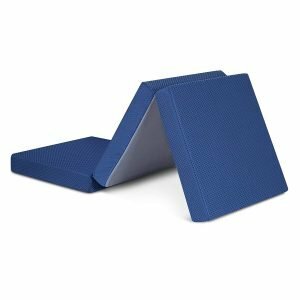 Why do you need a foldable mattress? There are several different advantages to owning a foldable mattress. The first and perhaps the most important is how portable they are. Unlike a standard mattress that is relatively heavy, foldable mattresses are light and easy to carry. This makes them ideal for camping trips or for when you are going to pay a visit to your relatives and stay for a little while. Another large factor in a foldable mattresses portability is the fact that they can be folded. This foldable nature is in stark contrast to a standard mattress. Standard mattresses are always the same size, which makes them very difficult to move around your home, let alone take with you when you are traveling. Finally, since these mattresses can be folded up to a fraction of their size, they are perfect to use when you have extra guests coming. Since they can be folded up, they don’t take up nearly as much space as a standard mattress, which makes them easy to keep tucked away in storage until you need them. 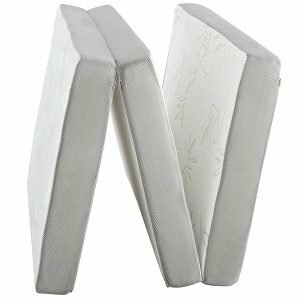 There are several different factors that you need to take into account when you are looking for the best foldable mattress. In this section, we will detail everything you need to know so that you can be sure to make the best choice on your purchase. When you are shopping for a foldable mattress, there are three different dimensions that you need to keep in mind. The first is the size of the mattress when it is unfolded. This will tell you how much space the mattress will take up in your tent or on the floor. It will also help you to determine how big a person can use the mattress. The second dimension you need to consider is how thick the mattress is when it is opened up. This will tell you how supportive the bed is going to be. If you are looking for a firmer mattress, then you can go for one that is thinner, while you need a thicker mattress for more comfort and support. Finally, the last dimension you will want to take into account is the size of the mattress once it is folded up. This will help you to determine where you can store the mattress. If you have a smaller space to store your new bed, then you will want to go with a more compact model. On the other hand, if you have a larger space, you can go for a larger one. Foldable mattresses are, by their nature, relatively light. Of course, there are several different weights available. Based on what you are going to be using the mattress for will determine the weight you should be prepared to deal with. 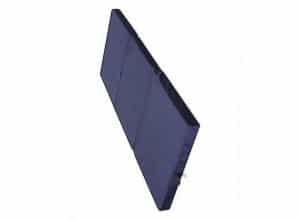 If you are looking to get the best foldable guest mattress, for instance, you are probably going to want to select a thicker model. This will usually add to its weight. However, it won’t make it too much of a factor since you are going to be keeping this mattress at home anyways, so you won’t have to haul it very far when you use it. However, if you are looking for a mattress for camping or travel, then you’ll probably want a lighter one. The last thing you want to have to deal with when you are already carrying suitcases or camping gear is a heavy mattress. Some models offer to carry straps to help deal with this weight, like the American Furniture Alliance Hide A’ Mat. 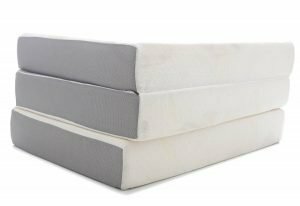 When it comes to the materials used in your foldable mattress, there are several different options to choose from. These materials will help determine the durability and comfort of the unit. If you are looking for a super comfortable, then you will want to get the best foldable memory foam mattress you can get your hands on. Memory foam mattresses conform to your body to provide a lot of support, even if the mattress is on the floor. If this is what you are looking for, then you might want to check out the LifeSmart Memory Foam Ventilated Foldable Mattress which is thick and supportive. The only problem with memory foam mattresses is that they are heavy and more expensive than other mattresses. If you want to save space and a bit of money, then you can look for a model that uses other materials, such as polyurethane or high-density foam. These materials are not quite as comfortable as memory foam but are lightweight and budget-friendly. Depending on what type of sleeper you are or the body type you have, you should get a mattress firmness that will provide the support you need. For instance, if you are someone who sleeps on their sides, then you will want to get a softer mattress like the Magshion Sleeper Chair Folding Foam Bed. This will allow your body to sink into the mattress enough so that your head and spine can be aligned properly. That way, you will be able to wake up feeling rested and relaxed. On the other hand, if you are someone who sleeps on their back, then you will want a firmer mattress like the one from Best Choice Products. This will allow your head, back, and neck to be on a level with each other. Thus you will wake up without any neck or back pain. 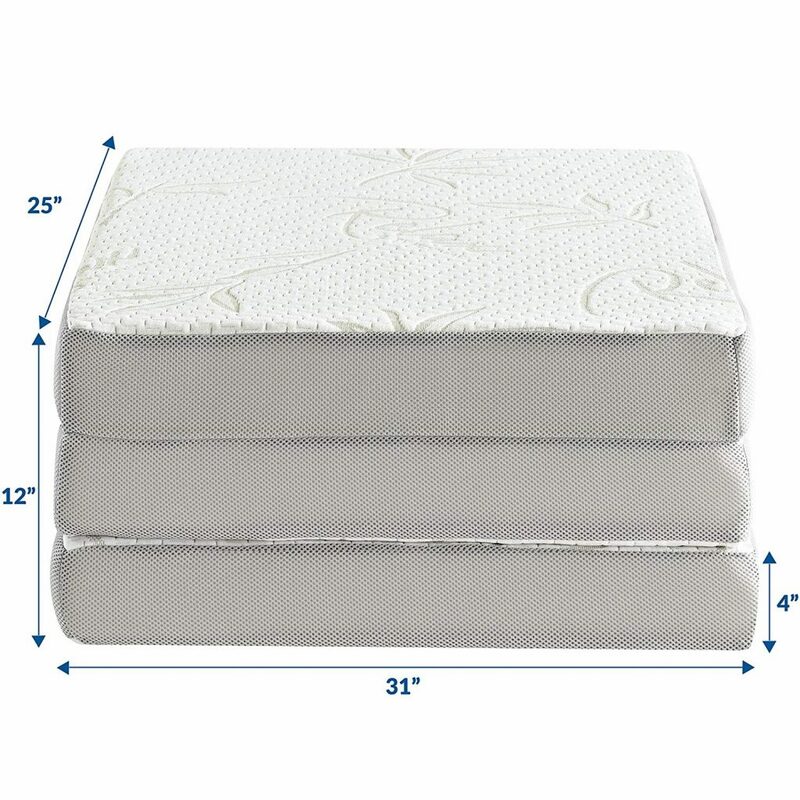 Finally, the firmness level that you select will depend on where you intend to use the mattress. If you are going to be using the mattress for tent camping, you will want to go for a firmer one. This way you’ll avoid any pain you might experience from rocks or roots on the ground. You can go for a softer mattress if you are only going to be using your foldable mattress in a home since it will only lie on a smooth surface. While it might not seem like that big of a deal, the cover that comes with your mattress will go a long way in determining how long your mattress will last and how breathable it will be. 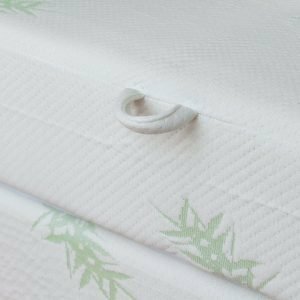 There are several different materials that you can choose from when it comes to a mattress cover, with cotton and bamboo-based materials being the most breathable. 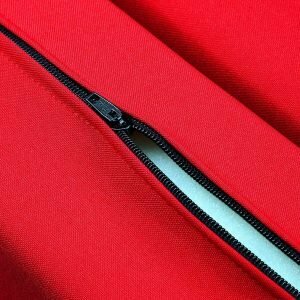 Polyester covers are much easier to clean, however, which makes them a great choice for younger kids. The best covers are going to be easy to clean. They should be removable and washable. Otherwise, they are liable to get dirty quickly. 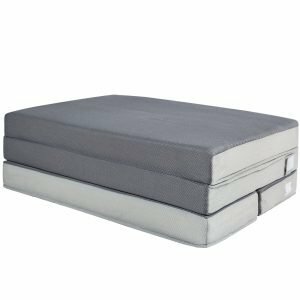 Another great feature to look for in a cover is a textured bottom, like on the LifeSmart Memory Foam Ventilated Foldable Mattress. This will keep the mattress in place during the night, which will lead to a better night’s sleep. There are several different additional features that, while not essential to a good night’s rest, add an extra touch of convenience to your sleeping experience. For instance, the D&D Futon Furniture Long Twin Size Folding Foam Bed comes with a built-in cushion. This makes it highly portable since you don’t’ need to bring a pillow along with you when you use it. If portability is important to you, then you should be specific to look for a model that has some sort of carrying straps. This will make it much easier to transport, which is ideal if the mattress is heavy, or you are on vacation. The Cozzzi Twin Folding Mattress, Best Choice Products 4in Thick Folding Portable Twin Mattress, LifeSmart Memory Foam Ventilated Foldable Mattress, and American Furniture Alliance Hide A’ Mat all come with a convenient carrying system to make transportation that much easier. Something else to keep in mind when you are looking for a foldable mattress is whether or not you can use them for more than just sleeping. 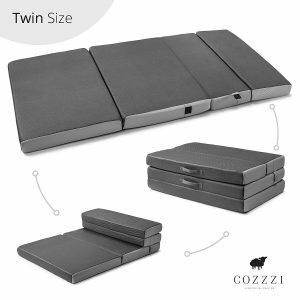 The Best Choice Products 4in Thick Folding Portable Twin Mattress can be set up in such a way that it is like a small personal-sized sofa, which is nice for guests or camping. Which model is the most convenient to take along when traveling? 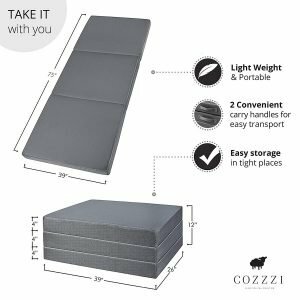 If you are looking for a great foldable mattress for travel, then you want to keep a few things in mind. First off, the mattress should be relatively light. That way, it will be easier to carry along with you no matter where you travel. Secondly, you will want to make sure that the mattress is relatively compact. Thus, you won’t have trouble fitting it into your vehicle as you travel. Finally, something else that will make travel easier is a carrying strap. This will make it simple to pick up your mattress and go. 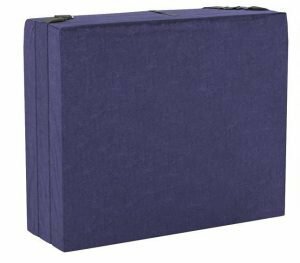 If you want a model with a carrying strap, then the most lightweight option is the American Furniture Alliance Hide A’ Mat. Are foldable models less durable than regular ones? The durability of a mattress is largely dependent on how thick and firm it is. The thinner the mattress, the less durable it is going to be. This is also true for softer mattresses. Of course, when you compare a foldable model to a standard bed, there isn’t too much of a difference in durability. That is, of course, until you consider how they are used. Since standard mattresses never leave the room that they are in, they have the ability to endure less punishment than a foldable mattress. To help to extend the lifetime of a foldable mattress, be sure to keep a good cover on it at all times. 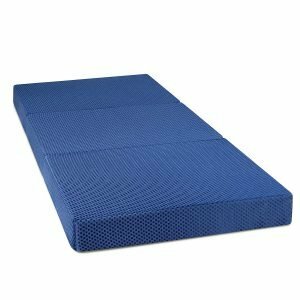 Can I use such a mattress as an exercise mat? 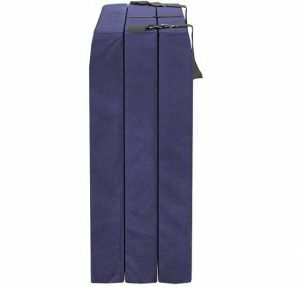 Whether or not you can use a foldable mattress as an exercise mat comes down to several different factors. You certainly don’t want to use a super plush mattress for exercise. This would make it harder to keep your balance as you perform your different exercises. It would probably also be a better idea to look for a firmer model. This will help the mattress to stand up to the punishment that you will dish out on it as you exercise. The Olee Sleep OLR04TM02S is a good option if you are trying to find a foldable mattress to use while you exercise. I’m a stomach sleeper. Which firmness is the best in my case? If you are a stomach sleeper, then it is probably best that you go for a firm mattress. This will allow your spine to be properly aligned during the night. If you pick a mattress that is too soft, then your body will sink in too much, and your head will remain up high. This will make for an uncomfortable night, which is less than ideal. Is it convenient to use such mattresses on the floor or I need a separate bed frame for this? These mattresses are designed to be portable. This makes them perfect to use without a bed. You can simply put them on the floor, which makes them perfect for traveling or for guests. If you truly want to make sure that you get the best foldable mattress you possibly can, then we highly recommend you try out the LifeSmart Memory Foam Ventilated Foldable Mattress model. It is very comfortable, lightweight, and durable enough to last through tons of use. The bamboo cover also makes it easy to keep clean, and the grips on the bottom make it easier to get a restful night’s sleep. 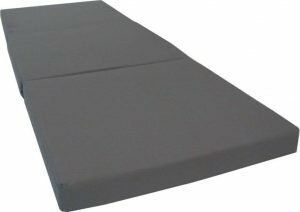 If you are looking for a great foldable mattress to use in a camper, then you should try the Milliard 6-Inch Memory Foam Tri-fold Mattress. It folds up into an extra comfy couch that saves a ton of space, which is essential in a camper. It can also be laid out on the floor to be used as a mattress on its own too. 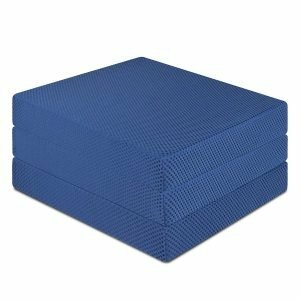 Foldable mattresses are also an excellent option for use with little ones. The Milliard Pack and Play Mattress doesn’t take up a ton of space but will provide your child with plenty of comforts, whether it be at home, on vacation, or camping.